Method of describing large parcels of lands as being entire sections, or regular percentages of sections. Under the public land survey system employed in most southern and western states, the states were divided into townships containing 6 square miles each. Townships were subdivided into 36 sections, and each section had 640 acres. Smaller parcels are described in terms such as quarters or halves of sections. 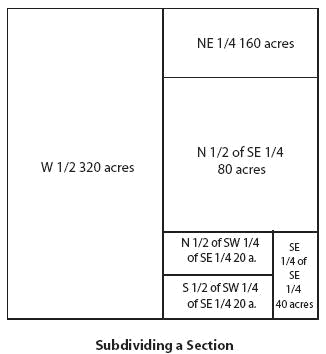 All townships and sections are numbered, so it is fairly easy to identify a particular parcel of land by reference to its section township number, section number,and then its quadrant within the section.